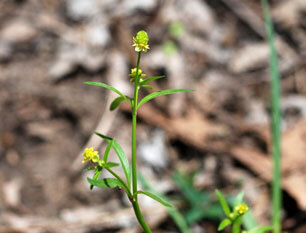 Also Called: Little-leaf buttercup, small-flowered crowfoot, small buttercup, kidney-leaf buttercup. Stems: Usually single, occasionally several, erect or nearly erect, frequently branched above, hollow, somewhat succulent, glabrous throughout or sparsely pubescent above. Leaves: Alternate, variable, glabrous; basal leaves persistent, simple, long-stalked, heart-shaped to kidney-shaped, 2/5 to 3 inches across, undivided or sometimes 2-3-lobed; margins scalloped; stalk 4/5 to 6 inches long; base shallowly to deeply heart-shaped; stem leaves sessile to nearly sessile, usually 3-5-cleft; segments varying from linear-lanceolate with entire margins to egg-shaped with irregularly toothed margins; upper stem leaves divided to base into narrow segments, reduced to bracts above. Inflorescences: Flowers, 3-50, borne singly on terminal or axillary stalks. Flowers: Somewhat inconspicuous, 1/6 to 1/4 inch across; sepals 5, ovate to elliptic, 1/10 to 1/6 inch long, spreading, glabrous to minutely hairy on lower surface, greenish-yellow, margins whitish; petals 5, elliptic or lanceolate, 1/12 to 1/8 inch long, shorter than sepals, lustrous, golden yellow, fading white; stamens 15-30; anthers yellow; pistils green. Fruits: Achenes, tiny, egg-shaped, 1/20 to 1/13 inch long, shiny, 10-50 in egg-shaped to short-cylindric head that is 1/8 to 1/3 inch long, 1/10 to 1/5 inch wide. Habitat: Damp shaded areas, open woods, borders of woods and thickets, stream banks, ditches, roadsides, waste ground; moist soils. Toxicity: Some Ranunculus species are reported to be toxic to livestock when consumed in large amounts. Toxicity decreases when dried in hay. Symptoms of poisoning include vomiting, diarrhea, tremors, seizures, and blindness. Uses: Native Americans used the juice as a sedative, gargled an infusion for sore throats, and cooked and ate the leaves as greens. Smashed roots were boiled and the liquid taken to counteract poisons and to relieve sore muscles. Comments: From Latin ranunculus, "little frog", possibly alluding to wet habitats favored by plants in this genus and abortus, "miscarriage", alluding to the reduced petals.